People wait for the bus alongside the fence that surrounds 58 West Hastings St.
A longstanding campaign to bring all welfare-rate housing to an empty lot in the Downtown Eastside appears unlikely to succeed, despite years of spirited activism and the recent election of one of its most prominent supporters to city council. In a recent letter, the Vancouver Chinatown Foundation, which has committed to raising $30 million for a planned social-housing development at 58 West Hastings St., informed city council it does not support an entirely shelter-and-pension-rate building at the city-owned site, arguing that it is not financially viable. Jean Swanson, an anti-poverty activist turned COPE city councillor who has been fighting to achieve 100-per-cent shelter-and-pension rate at the West Hastings site for over a decade, is frustrated by the foundation’s decision. She also seems unlikely to back down. “We need at least 2,181 units of welfare/shelter-rate housing in Vancouver today,” said Swanson. That figure is the same as the number of individuals recorded in Vancouver’s 2018 homeless count, which found more people were living without a home than ever before. According to recent statistics provided to The Thunderbird by the City of Vancouver, 763 units of shelter-rate housing were constructed in the past 15 months. Shelter rate, also known as welfare rate, is the cheapest housing in the province. The current shelter rate is $375 a month for a single person and $570 a month for a couple or a single parent with a child, amounts which are deducted from an individual’s monthly provincial income assistance. For a single person receiving $710 a month, the allotment for shelter represents a little over half of their total monthly welfare payment. Pension-rate housing is slightly higher than shelter rate, coming out to about $450 a month for a single person. The foundation, along with its funding partner BC Housing, a provincial Crown agency, is instead striving for a scenario where half of the building’s 231 units are rented at shelter-and-pension-rates and the other half directed at low-to-middle-income earners on a rent-geared-to-income basis, known as housing income limit (HIL) rates. HILs-rate units would likely start at about $1,200 a month for a one-bedroom apartment, below market but much more than many in the DTES can afford, according to Swanson. The bottom three floors of the 10-storey building will feature commercial retail space as well as a health centre run by Vancouver Coast Health. Last year, BC Housing committed $30 million to the development, now estimated to cost $108 million. According to BC Housing, construction is expected to begin later this year. However, in the Chinatown Foundation’s letter to council, described by Swanson, the foundation said it has struggled to secure funding for the project. Business in Vancouver also recently reported that the foundation believes it now has to raise more than its original $30-million commitment. Attempts to reach Carol Lee, the chair of the Vancouver Chinatown Foundation, were unsuccessful. A mural overlooking the city-owned site. Swanson and housing advocacy groups like Our Homes Can’t Wait believe the emergence of “social-mix”-style development, which often feature a mixture of market and non-market housing, has led to an increase in local rents and displaced residents of the city’s poorest neighbourhood. But, to some, their call for 100-per-cent shelter-and-pension-rate housing feels out of touch. 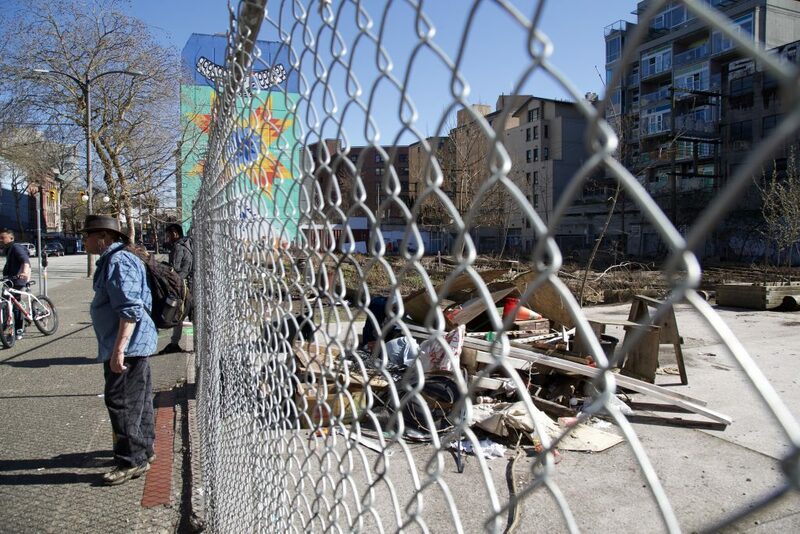 “The idea of 100-per-cent shelter-rate for a new building is kind of an old-school way of doing things that scholars and housing experts suggest is not the best form of housing,” said Pete Fry, a recently elected Green Party city councillor. In recent decades, social mix has become a fixture of conventional urban planning. Meanwhile, developments containing only subsidized housing are now less common, partly due to the legacy of North America’s low-income housing projects, which became synonymous with racial segregation and abject poverty. However, a debate over the benefits and drawbacks of social mix persists among planners, academics and activists. “By allowing a mix of ownership and rental housing, by having different income groups living there, it would mean that new shops could come into the neighbourhood,” said Michael Geller, a local real-estate consultant. He believes social-mix policies can revitalize rundown neighbourhoods. On the other hand, Geller says Swanson’s push for entirely shelter-and-pension-rate housing would further wall off the low-income community from the rest of the city, discouraging business investment and allowing illicit drug use and mental-health issues to continue to fester. Geller’s views echo an enduring argument among supporters of social mix: a rising tide lifts all boats. Proponents often argue that by introducing people of higher incomes into a low-income neighbourhood, the lives of the poorest will improve as they become exposed to different social norms and valuable new resources and services. While the idea of a social mix may sound appealing, he says, in practice it can lead to gentrification, resulting in a community that lacks social and economic diversity altogether. But Stephanie Allen, a local housing expert, says not all forms of “social mix” are created equal. She acknowledges that developments containing an overwhelming majority of market condominiums, such as the oft-criticized Woodward’s development, can create problems. But buildings that feature a majority of non-market housing, especially when entirely rental, can avoid the gentrification that Swanson and Blomley describe, according to Allen. 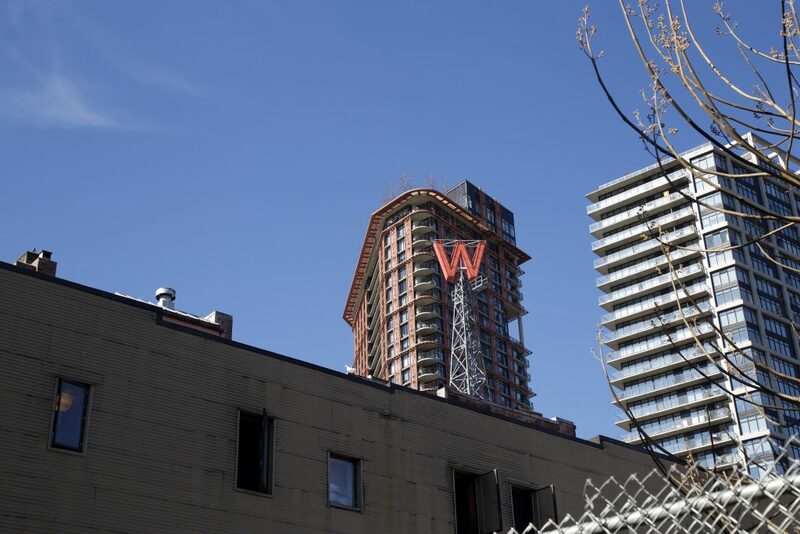 The Woodward’s logo looms over the Downtown Eastside. The arrangement Allen presents closely resembles the Chinatown Foundation and BC Housing’s plan for 58 W. Hastings, an entirely rental building comprised of only social housing, with half of all units at shelter-and-pension-rates. Though she understands Swanson’s motivations, Allen has deep concerns over her push for 100-per-cent shelter-and-pension-rate housing at the Hastings site. According to a 2013 report from the City of Vancouver, the DTES has a much higher proportion of Aboriginal people than the rest of the city. In November, Swanson introduced a motion to recommit the city to a completely 100-per-cent shelter-and-pension-rate building at 58 West Hastings, prompting city council to direct staff to assess the financial viability and potential funding necessary to make that a reality. A report on their findings is expected to be released shortly. Though now it appears that scenario is no longer on the table. A frustrated Fry says more of these types of delays could jeopardize the project altogether. “I know where the Our Homes Can’t Wait and Jean’s perspective is coming from, but I don’t agree with them, frankly,” said Fry, who says he’s lived in the DTES for the better part of 25 years. He believes the call for a 100-per-cent shelter-and-pension-rate building was unrealistic from the start. 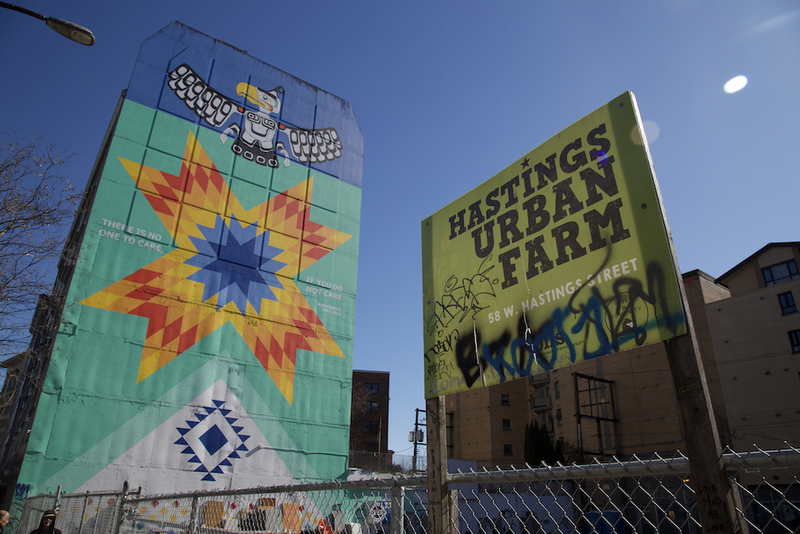 Fry took specific aim at former Mayor Gregor Robertson, who in 2016 promised an entirely shelter-rate building at the West Hastings property despite having not secured funding for the project. Though Vancouver may offer up land for social housing development, the city typically depends on limited funding from senior governments to see these projects through.